There’s a lot of talk about drivers and there’s no doubt the club taking up the number one slot in the bag is important but it’s also true the clubs in the other end of the bag, the wedges, are important as well. It’s wonderful to hit a booming drive but if you can’t wedge it close going low will be tough. The secret about wedge play is there is no secret. It just takes a basic knowledge and the selection of the proper wedges for you, plus of course maybe a lesson from a PGA Professional. To maximize results make sure the lofts are correctly gapped so the distance each wedge goes with a normal swing is about 10 to 15 yards different than the next more lofted wedge. This is often, but not always, four degrees of loft. An example would be the wedges in my bag starting with the pitching wedge which has a loft of 45 degrees and using a “normal” swing flies 120-125 yards. Next is a 50 degree “gap wedge” good for 105 to 110 yards, then one with 54-degrees of loft used for 90 to 100 yards and finally a 58 degree wedge at 80 yards. So, four wedges effectively covering a range of 40 plus yards. It’s important to note—and this is another “secret” that’s not really a secret—ideally you would carry the wedges that give you as many full swings as possible in a round realizing though, no matter what loft your wedges you will always be faced with in-between yardage shots. There is no magic formula and gapping to a certain extent is a matter of personal preference. It comes down to getting it right so you hit the ball closer with more confidence. A discussion about bounce, that other vital aspect of wedge selection, will be covered in another article. 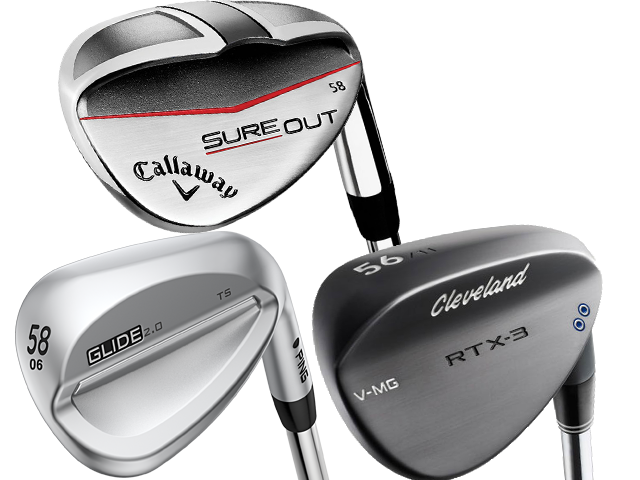 Callaway Golf Sure Out: The name was used by the original Ben Hogan brand and since Callaway owns the name they were able to bring it back for a super game improvement wedge designed with input from instructor Hank Haney. Callaway’s team made the Sure Out with lots of sole camber, i.e., curvature from heel to toe. Additionally there is lots of bounce to help it through sand and long grass and 17 grooves that go all the way across the face. These features plus a nice wide sole mean sand shots, greenside pitches and even flop shots can be hit without opening the face or cutting across the ball, techniques that “scare” many average golfers. Priced at $120, Sure Out wedges are available with either lightweight steel or graphite shafts in 58 or 64-degrees of loft. Cleveland Golf RTX-3: Compared to Cleveland’s previous RTX-2 model, nine grams of weight has been moved from the hosel to the clubhead so the center of gravity is closer to the impact area making a noticeable improvement in feel. For more consistent contact there are three different V-grind soles to match your swing profile and Cleveland’s third generation micro-milled face in between the grooves provides more spin and thus control. Choices include finishes of black satin, Tour satin and Tour raw plus there’s a cavity back version. The available lofts range from 46 to 64 degrees and each is priced at $130. Ping Glide 2.0: The updates of the original Glide wedges involved making grooves sharper-edged and slightly decreasing the spin between to increase friction to produce more spin. Impressively Ping lab testing reports the Glide 2.0 generate up to 400 rpm higher spin which is important to aid in getting the distance and trajectory just right on every shot. We especially like this wedge’s finish which the company has tagged “hydropearl.” It not only looks good but sheds moisture to reduce the chance of flyers. Ping offers four sole grinds to match your attack angle and the turf conditions at the course you most often play. With steel shafts they are priced at $140 per club.